Central Plains coach Chris Steiner and Victoria coach Doug Oberle know their teams return plenty of talent, especially at the skill positions, for the two eight-man Central Prairie League powerhouses. In Steiner’s eyes, the difference in the season-opening contest will come with the inexperienced personnel. “See whose new kids do the best,” Steiner said. On Friday, the Oilers, ranked No. 4 in Eight-Man, Division I, will play host to the Knights, No. 2 in Eight-Man, Division II. Last season, Central Plains finished 9-2, while Victoria went 10-1. In 2013, Victoria defeated the Oilers, 66-28, on the road in Week 4, a contest that produced a season-ending knee injury to then-Knights senior quarterback Sam Ottley. In 2012, the teams also played in Week 4, a 40-22 Victoria win. Central Plains defeated Victoria in 2011, 40-20. Prior to that, Quivira Heights and the Knights had a strong rivalry before QH and Claflin consolidated to form Central Plains. The Oilers are 22-9 overall since the change, 13-3 at home. “We are going to find out where we are at without question, and hopefully we are going to play a great game, and we are going to compete to the end,” Oberle said. Steiner and Oberle, two veteran coaches, don’t mind playing each other, especially since the teams are in the same league; Oberle said Victoria isn’t going to “shy away” from playing league schools. “We’ve just got to get better at that first game, and hopefully we are lucky enough to pull out a win, but obviously we have got to play extremely well, and we’ve got to catch some breaks,” Oberle said. On Monday, Central Plains practiced in the morning, and then watched film of last year’s contest. The game was 14-14 after the first quarter, but Victoria tallied 24 unanswered points in the second quarter. 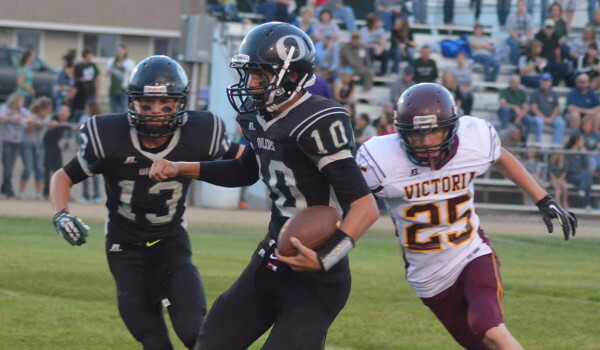 Victoria finished with 430 yards of offense, 348 on the ground, and Central Plains had 309. In film study, Steiner pointed out multiple missed opportunities for Central Plains, a team that finished fifth in its classification with 526 points. Central Plains returns star junior quarterback Braedan Crites and senior all-purpose threat Layne Bieberle. Crites threw for 2,051 yards with a 38/4 TD/INT ratio. Bieberle finished with 46 catches for 1,048 yards and 24 TDs, just five off the eight-man single season record. He also collected 1,740 all-purpose yards, 123 tackles and 10 interceptions. He caught at least one TD pass in every game. The Knights return its backfield of junior quarterback Brady Dinkel, senior running back Bryan Dome and junior fullback Lane Kisner. Dome had 854 rushing yards and 11 scores and Kisner finished with 759 yards and 10 TDs, including 199 yards and three TDs against Central Plains. Dinkel passed for 333 yards, rushed for 321 and accounted for 20 TDs. Victoria, a longtime option team, is expected to run varied looks, including spread, this season. “All three are very good kids, and they run the option so well, they always have,” Steiner said. But the difference could come in the new starters, especially along the interior lines. Central Plains, a 2A school, has more than 30 players out. Victoria, a 1A school, has 20 players with two seniors. The Oilers had to replace fullback/linebacker/punter Colton Zink and center/defensive end Evan Liebl. Zink had 146 tackles, Liebl 135, and finished 1-2 on the team. Offensively, Zink played three positions. Senior Carson Kirmer, who played some fullback last season, will step into a full-time role at fullback and will play some single back. Junior Jacob Warnken, a transfer from Hoisington who couldn’t play last year, will play single back and linebacker. Junior Michael Ryan will shift from guard to center and replace Liebl. Junior Trustin Kreft will play nose guard after missing most of last year with injury. Ryan will take over for Liebl at defensive end. The 6-foot, 180-pound Ryan is much smaller than Liebl. The Knights had to replace two all-state lineman and Tanner Hobbs, a three-year starter at end. Victoria expects a big season from junior Eric McAlonan, a former fullback, who will now start at center. Juniors Wheaton Hockersmith and Brandon Brungardt will play guard and both will see time at nose guard. McAlonan will be at defensive end.